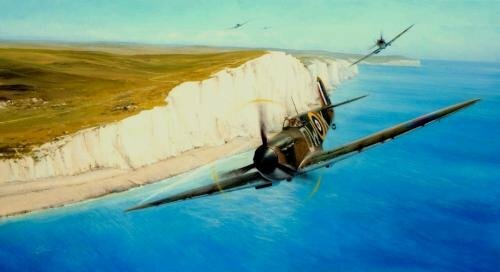 Coastal Patrol, a new painting by the remarkably gifted young artist Richard Taylor, depicts Mk I Spitfires of 610 Squadron flying a defensive patrol low over the White Cliffs during the height of the Battle of Britain in August 1940. A superb painting that symbolises a crucial period in history. Joining artist Richard Taylor in signing each print in the edition are THREE Spitfire fighter pilots who flew and fought in the Battle of Britain. Every print is individually hand-numbered.